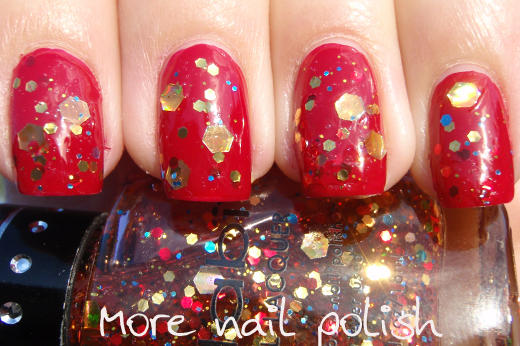 I have another Nabi glitter polish to show today, this one is called 'Mix Big Glitter'. 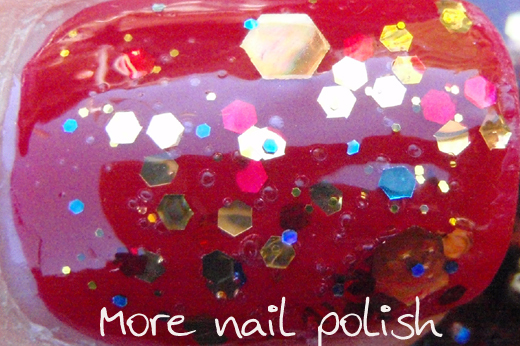 The polish contains large and medium sized gold holographic hexes, medium sized blue holographic hexes and small blue and gold hexes all in a slightly red tinted base. In the bottle this polish is pretty spectacular. But damn, if this wasn't the most difficult polish for me to apply in the history of applying polishes, then call me a crazy cat lady. 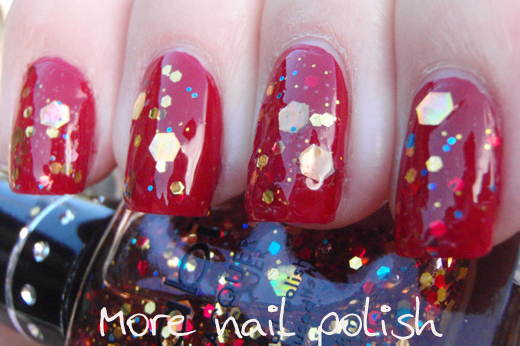 These photos show two coats of the glitter over a Bourjois red, which I can't recall the name of, but it was one with one of those massive flat brushes I featured on this post. I needed some sort of fancy lure to fish out the large glitter pieces, I had to dip the brush around five times to finally get a piece. Because of all that fishing in the bottle it became really thick and gluggy, but I didn't want to thin it because then it would be just as hard to fetch out the glitter. Anyway, I persisted with the two coats, then a coat of Seche Vite and in the end it looked like I had massive thick gel nails on. The top of the nail was dry, but it was still really dentable when I went to bed. The next morning I took these photos and I've selected the best photos here that hide the flaws as much as possible. Check out the massive shrinkage I got on the ring finger, it pulled back about 1mm. Oh yeah, and look at those embedded bubbles on this thumb nail. 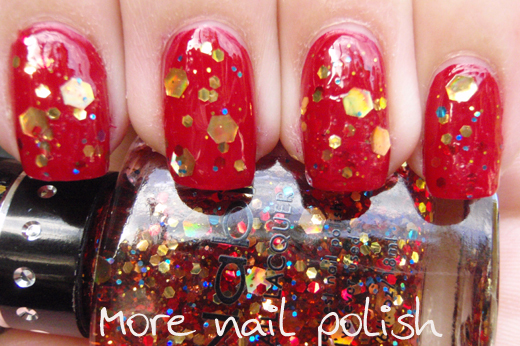 Because of the thickness of the polish, you couldn't feel the bubbles at all. I actually wish I could create these bubbles in a regular top coat, where the finish is totally smooth, as it might look like some really cool nail art effect. This polish was still dentable after more than 24 hours when I decided to take it off, because I was starting to pick at the glitter pieces. 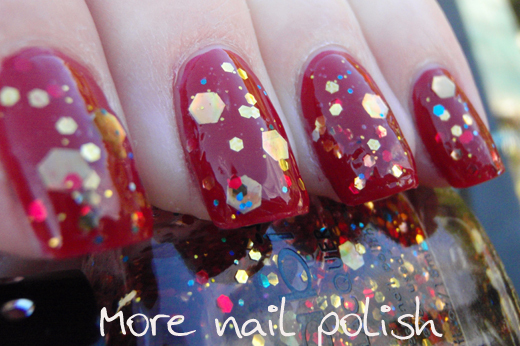 I totally love this polish, but for me it just needs more glitter to make it more usable. I feel like getting another bottle, straining them both to just get the glitter, then mixing them into my own suspension base to get a double saturated glitter. Man I wish I could just but solvent resistant glitters like these to franken with. I have a couple of Nabi's with stars and hearts and have entirely the same problem... the base is too think, the pieces to sparse so you end up fishing and getting gloopy clear base everywhere. SO annoying. I gave up and use regular sequins now. Such a shame 'cos they're always so cool! Your nails look awesome though! You did a great job despite difficulties. Those hex pieces look awesome - shame about the effort to get them there though.